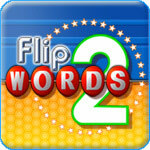 Flip Words 2 Game - Download and Play Free Version! Prove Your Mettle Against Others in the Ring of Spelling! Back on the Flip Side! Do you long for a simpler time? When you could get a thrill just from filling in the blanks of mysterious words and expressions? No, probably not. But that doesn’t mean you still can’t have fun like that! And a lot of folk already have! So in comes Flip Words 2, sequel to the hit letter-flipping, phrase-catching, time-eating puzzle game. It’s got everything that was great about the original and a whole lot more! If you missed the first Flip Words, don’t worry! With Classic Mode, you get nothing less than the original experience! Spell words from the crazy assortment of letters presented on the board. Bigger words get you more points! Try to crack the secret hangman phrase. But watch out, you’ve only got so many turns to succeed. Earn even more turns, or increase your score using special letters. If Classic Mode is too easy for you, or you played Flip Words so much that you can no longer spell “wrong” wrong, then maybe the all new Strategy Mode is what you need. With a more restrictive system involving tokens and no easy way to retrieve them, this exciting new game will test everything you’ve learned from classic Flip Words gameplay. More options available! 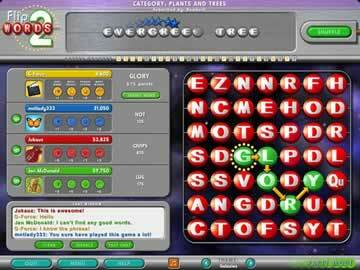 Cash in tokens to buy vowels, hints and larger words. Spell longer words to earn tokens back. If playing by yourself is getting boring, then know that there are other players like you just waiting for a challenge! Play cooperatively online with up to four other players in Party Mode. No waiting whatsoever! Dynamic matchmaking system allows you and others to hop in and out of a game at anytime. Keep the competitive edge! Earn special titles at the end of each round based on your performance, and climb the online scoreboard ladder. Play with your friends by forming a specially made game code. Even if you’re a loner at heart, keep your game connected. You can download new custom phrases to keep your game fresh, or create and upload new ones yourself. Rate phrases you come across to make them and their creators more common for you and players all over the world. 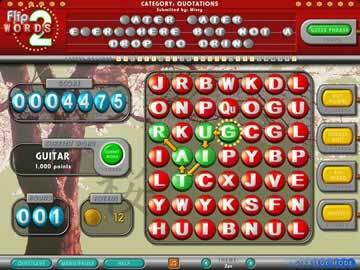 At any time in Flip Words 2, you can change the background and music. Choose from a dozen themes, including a Japanese Zen garden and outer space. Don’t get stuck in a theme you can’t stand - use something that’ll put you in a spelling mood! Whether you’ve already played the original Flip Words, or are only joining in, Flip Words 2 has something for you. Ease yourself with classic gameplay, challenge yourself with strategic thinking, or take it up with others online. There’s no shortage of content to find here, so let Flip Words put a spell on you today!